Do you have siblings? If yes then you certainly would have gone through the experience of sharing a bunk bed with your siblings. I remind my childhood when I had to share my bunk bed with my elder brother, so I always not that lucky as my elder brother because I had to climb up and climb down every morning as I was allotted the upper bed portion. But whatever was the situation I still have very fond memories of my childhood that I still miss. And I always loved my bed unless I had not grown too big to fit on that tiny bunk bed. A bunk bed is not only a kind of some storage hack that helps when you are running short of space, but it also generates a sort of attraction for the younger kids to get inclined towards this charming bed setting. In any case you might have a couple of your own kids and you might be planning to buy and install bunk beds for your kids. Because a bunk bed is perfect for even the kid who is too jaded, he would certainly get excited and would love to sleep in that bunk bed. 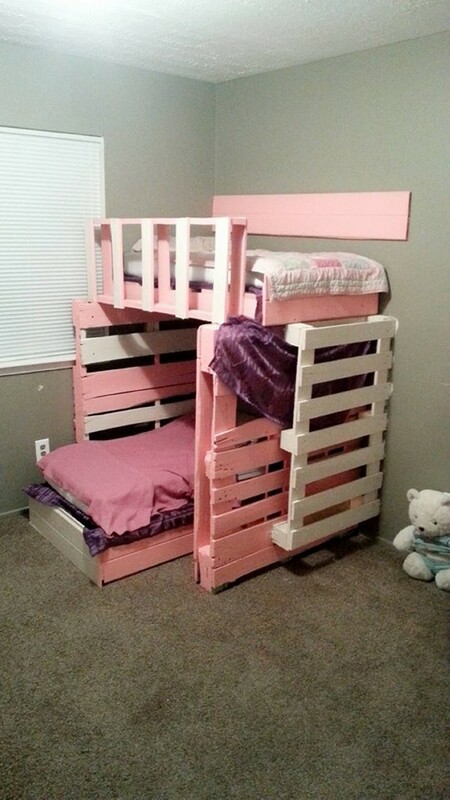 We have here an awesome wooden pallet recycled bunk bed that is just perfect for your kids. Look at the structure, whole of the body is repurposed by wooden pallet and nothing else. Also have a look on the color scheme, pink and white are probably the most appropriate colors for your kids. 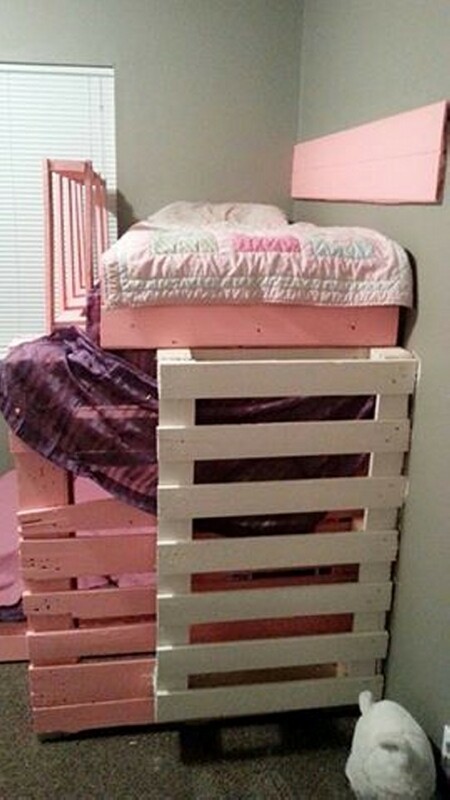 The pallet bunk beds upper and the lower one are quite spacious, and even the ladder connecting to the upper one is also recycled with the pallet wood. Despite of being spacious enough for your kids, they still do not cover much area of the room.